Meanwhile, the cost of hanging on to a middle-class lifestyle is increasing. As a 2010 report by the Department of Commerce found, looking at economic data from the past two decades, "The prices for three large components of middle-class expenses have increased faster than income: the cost of college, the cost of health care and the cost of a house." Texas isn't immune to any of this, of course. But it just may be the friendliest state for those who worry about their prospects in this new normal. For starters, the job scene is markedly better (more on that in a moment). And more crucially, it's cheaper to live in Texas and cheaper to thrive there too. Don't underestimate the power of that lower cost of living, for it can be the difference between a trailer and an apartment--between an apartment and a home. "... AND I WOULD GO TO TEXAS"
As davy crockett said in 1835, as his political fortunes ran out in Tennessee, "They might all go to hell, and I would go to Texas." The phrase Gone to Texas (sometimes abbreviated GTT) was the expression once used by Americans fleeing to the Lone Star State to escape debt or the law--posted as a sign on a fence or scratched into the door of an abandoned home. While today's migrants aren't the vagabonds and outlaws of the 19th century, people are still "gone to Texas." Texas is America's fastest-growing large state, with three of the top five fastest-growing cities in the country, according to Forbes: Austin, Dallas and Houston. 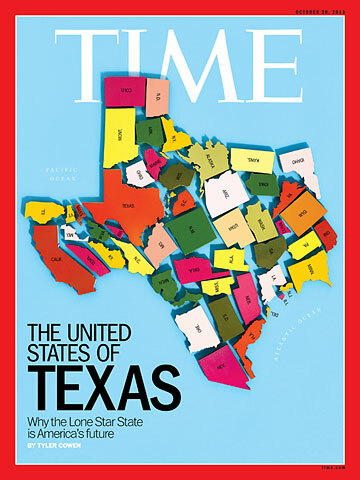 In 2012 alone, total migration to Texas from the other 49 states in the union was 106,000, according to the U.S. Census Bureau. Since 2000, 1 million more people have moved to Texas from other states than have left. To get a sense of who these migrants are, consider Tara Connolly. In 2005 the New York City native was sharing a 500-sq.-ft. apartment with her then boyfriend in Cobble Hill, Brooklyn--a gentrified neighborhood where studio apartments rent for about $2,000 a month and sell for about half a million dollars. Feeling stressed, restless and in need of a change, she read an article about Austin and decided to pack up and move, with little more than the hope of finding a job in her field, graphic design. Eight years later, Connolly is in her mid-30s and works at a hip marketing company in Austin, and she's the owner of a vintage midcentury home twice the size of her old New York City apartment. It comes with a mortgage payment half the size of her big-city rent. "Buying a house was not something I was thinking about when I came to Austin," Connolly says. "But here you have people in their 20s buying houses." When Connolly announced that she was moving to Austin, she was met with looks of alarm from her Bronx-born family. But she says that after visiting her and seeing her new home, her family has changed its tune. "They say they can't believe how green it is," she says. "They thought it was all tumbleweed."